With a single eject button the ThinkPad Ultra Dock includes a wide range of video, display and connectivity ports, so you can multi-task and be productive like never before. A variety of USB 2.0 and USB 3.0 ports provide connectivity and power for all your productivity accessories, including an always-on port for mobile device charging anytime, even when your laptop's not present. Connect up to three monitors for the ultimate in workplace efficiency, and it's made for large enterprise with no-hassle, peace of mind features like MAC address pass-through and PXE boot, and has lock slot for physical security. Driver-free this dock delivers crystal clear video quality thanks to Lenovo technology to make office work convenient, easy, and productive. 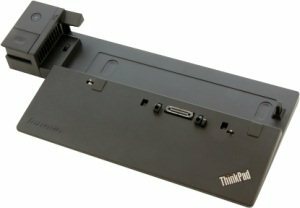 With the horsepower to drive mobile workstations, the completely re-designed and supercharged ThinkPad Ultra Dock grows capability without growing in size. The ultimate docking solution includes a wide range of video outputs, including HDMI, and support for multiple external monitors so you can multi-task like never before.